We interact with glass every day — we look through it, drink from it, and it helps us see clearly. But not all glass is the same, and our ability to modify glass and improve its qualities is what allows us to use glass in applications where it would have been a safety hazard. This modification process is referred to as glass tempering. Tempering is achieved through a thermal process. Chemical strengthening is achieved through an exchange path. The heat tempering process involves subjecting glass to very high temperatures and then cooling it quickly. During chemical strengthening, chemicals applied to the glass change the surface to create compression. In both instances, the outer surface of the glass is altered so that it has a higher compression than the interior glass which is in a state of tension. Tempered glass does not break apart and shatter as ordinary glass does. If the glass is broken, it will break into circular and small pieces and not sharp jagged shards that could cause harm. It is also easier and safer to clean up broken tempered glass without causing additional injury. Because of this it is widely used in high-pressure and explosion proof windows, lighting products, and doors for industrial and residential applications. The tempering process changes the composition of the glass giving it strength, durability, and scratch resistance. Tempering allows thin glass products to withstand harsh environmental conditions without losing their functionality. In medical, semiconductor, and energy applications, tempering enables glass to be successfully incorporated without fear of component failure. Its ability to withstand temperature fluctuations makes tempered glass suitable for aerospace and aviation applications, laboratory equipment, and household items. The ability to withstand high temperature and variations in temperatures makes this glass ideal for use in buildings to meet fire code regulations, fire engines, appliances, drinking glasses, cookware, and laboratory glassware. Swift Glass is a leader in manufacturing tempered and strengthened glass for a wide range of industries and applications. 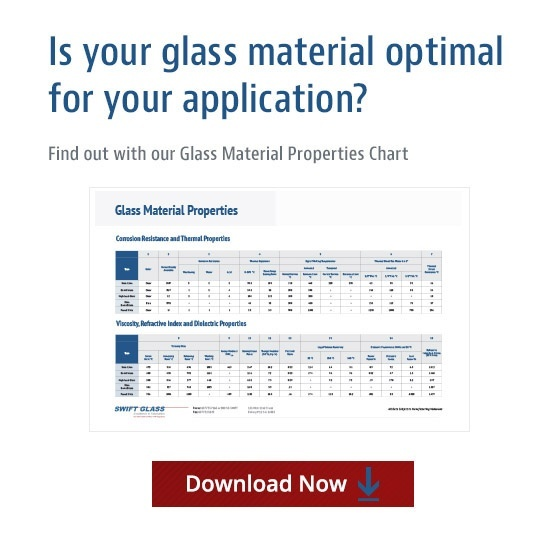 Our extensive material selection includes float glass, Pyrex®, and Borofloat®. Visit our website for more information about Swift Glass’s thermal glass tempering and chemical glass strengthening processes.